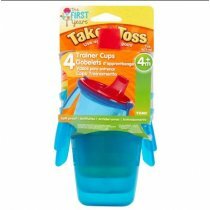 The First Years Take & Toss Sippy Cups are durable enough to use over and over, and affordable enough to treat as disposables. Ideal training cups for young, thirsty toddlers..
Patented snap-on lid prevents leaks, and fits other Take & Toss cups. Valve-free spout makes for easy sipping and thorough cleaning. Removable handles grow with your child. Translucent sides let you see how much drink remains. Four-pack contains four 7oz cups and four lids. BPA-free. Dishwasher and microwave-safe. Product colors may vary from those pictured here.